Wood is one of the most flexible building materials because it can be used in indoor and outdoor applications. While some outdoor materials differ from materials used indoors, some kinds of wood decking can be used in both settings. As a general rule, you can use any type of outdoor wood inside a house, although outdoor wood's finish may be rougher than the finish of wood designed for indoor use. Decking can be used in many situations. Any type of natural wood cut for use as a deck board can be used in interior as well as exterior projects. The main difference between outdoor wood and indoor wood is that outdoor wood is chosen because of its hardness and ability to withstand natural elements, and indoor wood is chosen for its beauty and softer finishes. Most outdoor wood is rough and needs sanding for use indoors. Some kinds of outdoor wood are used specifically in outdoor settings because they are superior due to their inherent properties. Redwood and cedar, for example, have built-in insect repellents as well as natural oils that help them shed water and fend rot far longer than other species, such as pine. While they still can be used in an indoor setting, the inherent properties that make them so useful outdoors can be overkill in an indoor setting. Natural wood can be used both indoors and outdoors, but some kinds of specialty wood cannot be used indoors. Pressure-treated wood should never be used in an indoor setting because it is manufactured specifically to be infused with preservatives and anti-aging chemicals that can be harmful to humans. Any wood that was chemically altered should be used only outdoors. Composite decking is designed primarily for outdoor settings, but in many ways it is similar to laminates because it isn't actually wood. 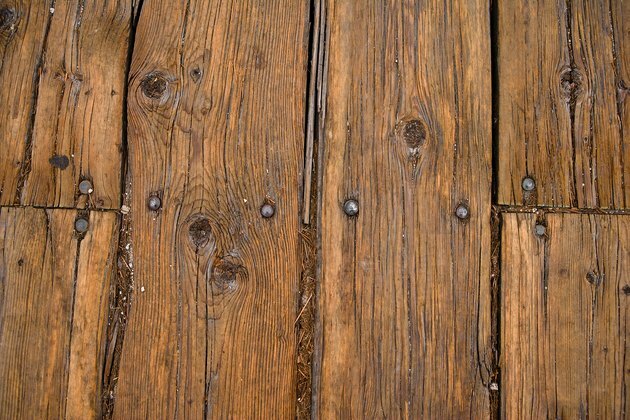 While composite decking boards aren't commonly used indoors, you could use them for interior flooring. The concerns for a solid base in composite decking's outdoor use need to be addressed for its indoor use, but otherwise you can install composite decking wherever you want.